Recycle and save your cans! Now you can make tin can crafts with those old food cans. Here are a few of my favorite crafts pictured below. Each thumbnail leads to you to the project instructions so you will know exactly how to make it. One of my favorites is the tin can luminaries, they look so pretty when they are lit up. The trick is that you freeze water in them before you pound the holes with a nail, so the can holds its shape. I hope to add to my craft collection below. I have plenty of ideas... some cute things I have seen done with tin cans are so cute! By covering them with some beautiful patterned scrapbook paper, you can create instant vases to match your decor. You can help organize your home with tin cans. Try making a place to store pens, pencils, markers, and colored pencils for your art table. A tin can works on the bathroom sink to hold make up brushes and eyeliner pencils, even a toothbrush! Coffee cans can be used in the kitchen to hold store plastic bags for re-use. You can create candle holders, bird houses, or little hanging planters! You can also create different looks by painting the tin cans, and stacking them or arranging them in a pattern. For instance, you could paint a letter on each can, and arrange them on your mantle to spell "Merry Christmas", or your last name, "welcome"; whatever you wish! You could create little figures, like a cute snowman for Winter. Paint three different size cans white and stack them up and add a face. Or, paint them to look like little jack-o-lanterns for Halloween. You can create pretty wind chimes using tin cans too! One tin can hangs from the ceiling, and then attach cord of different lengths with the soup can lids attached to them. You can make wind socks the same way, but hang ribbon or cloth strips from the bottom. Have an idea I didn't come up with? 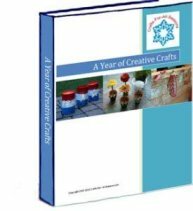 I'd love to hear about it, thank you and have fun crafting! Do YOU have any Tin Can Crafts you would like to share? It can become its own page on this website. Click here! Click Here to Submit a Tin Can Craft of Your Own!